Home » Bedrooms & Xuan Kong » Dream Cottage or Feng Shui Nightmare? How do you improve the Feng Shui of this dream cottage? I was very impressed with the comments regarding the cottage photo Sandra posted a few days ago. The responses confirmed my thoughts that subscribers to the Feng Shui Store Facebook page have a keen eye when it comes to Feng Shui principles. To build on this topic, I thought you might like a little more information on the external aspects of this delightful, dream cottage in beautiful Shrewsbury. Let’s break it down, and look at the T-junction location (poison arrows) of the home often considered a Feng Shui nightmare. Although the tall trees do buffer some of the negative qi energy of the T-junction, they are in fact too tall. The height and width of the trees block the ‘light’ qi flowing to this quaint cottage. Remember, we’re after balance, too much of a good thing can become a negative. 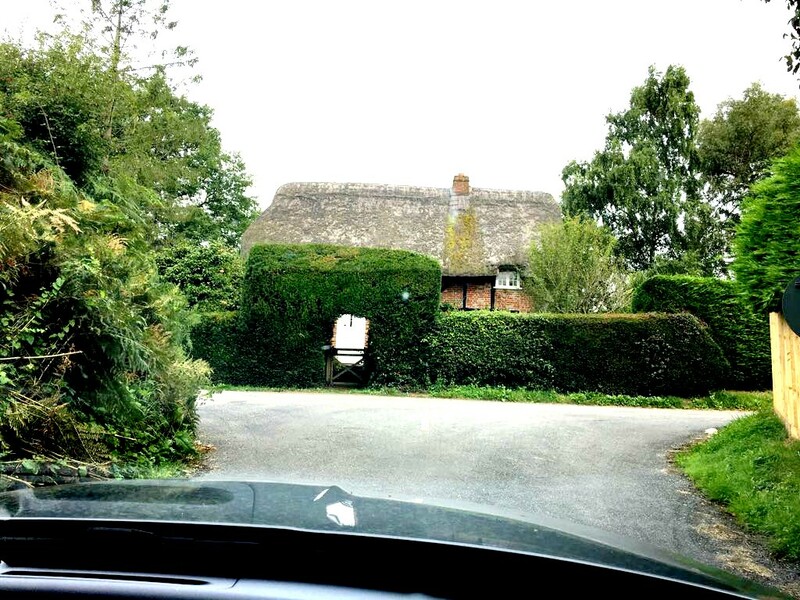 The second criteria are the carving out of the hedge which has created a minuscule entrance into the main property. Try to imagine breathing through a thin straw; you’d have to work hard to get enough oxygen into your system to improve cellular health. Well, it’s the same outcome here, the small and restricted entrance will result in only a dribble of vital qi energy flowing into the home. The occupants may experience ongoing lethargy as a result. Now, if you look closer at the property, you’ll find that the house, including the roof, looks very tired further depleting vital qi energy. This property is very typical of a British thatched cottage and is very much loved and sought after. 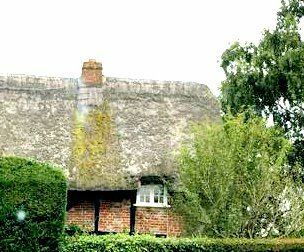 It is after all many couple’s dream cottage, and a trademark of these quaint thatched homes are the small windows. Feng Shui doesn’t necessarily consider small windows as bad. They certainly suit the style of the house and are functional in that they preserve heat within the home. In this case, however, the tall trees amplify yin dark energy and create sha chi (poison arrows). So, here’s what we’re looking at from a Feng Shui perspective and let’s ask if this is indeed a Feng Shui nightmare? 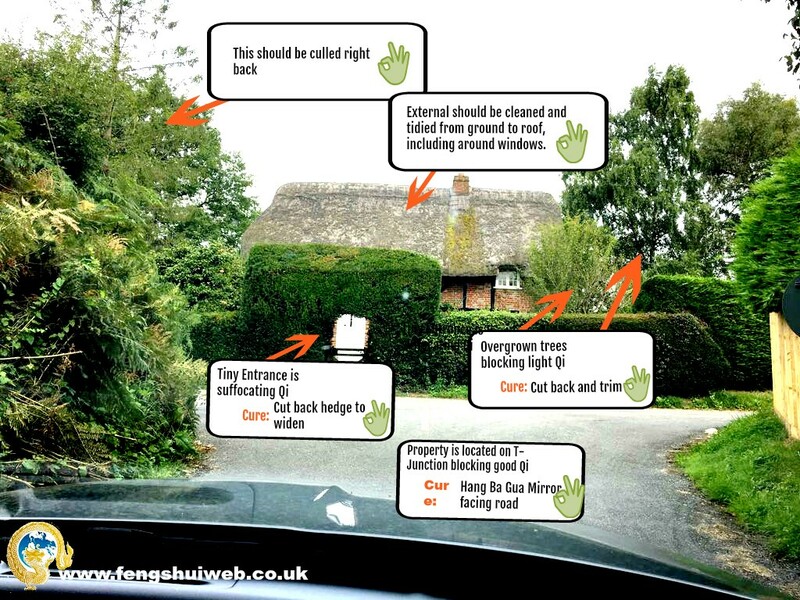 T-junction ( poison arrows pointing directly at the house). The trees do cushion the negative qi to a degree, but as they’re so tall, they block light qi. The small entrance, designed to create security, privacy, and intimacy of the home, but in fact from a Feng Shui point of view, reduces vital qi energy. The house, including roof, looks tired and neglected further reducing healthy qi and is creating sha chi (poison arrows). Small windows blanketed by trees and bush increasing yin dark energy. How do we turn this Feng Shui nightmare into a dream cottage? Hang a Ba Gua mirror, facing the road to deflect sha chi (poison arrows) and enhance positive qi (energy). To further protect the property from T-junction sha chi I would also suggest placing an object that resembles a canon on the exterior and, again, for it to do its magic, it must face the road. Improving the quality of qi in and around your home can be achieved very quickly. There is no need for compass readings to determine the facing directions of the home. Land formations around buildings comprise 70% of Feng Shui principles. Address the external elements of the property before making changes to the internal. All that’s needed now is for the owners of this property to keep on top of maintenance to ensure that shrubs and trees don’t become overgrown and out of control. Sensitivity to surrounding energy increases the longer you practice Feng Shui principles. There’s no part of your being, including your home life, relationships, finances or work that Feng Shui does not effect. Thereby, sensing a shift from positive to negative qi (energy) will become easier in time, and you’ll be able to stay on top of maintaining your home. I have attended thousands of Feng Shui consultations in every corner of the world, and it’s always a joyful and rewarding experience. The owners warmly welcome me into their homes or business, and I like to form an impression of the occupants and how they like to live their lives before I recommend changes. Do they live a relaxed, laid-back lifestyle or do they have a more formal approach to life? Finding a harmonious middle ground is the ideal outcome, and in the case of this charming, Shrewsbury cottage the goal was to create a clearer pathway to enable positive qi to enter the home while protecting the house from the T-junction energy and retain the heritage and cottage appeal. I have a antique Phonograph it is fine piece oak box with glass front and beaded work…ontop sits a big Brass ornate horn with painted flowers inside. Can you help me decide what direction this should go in my livingroom. ?